Submitted by Mason Hoberg on Oct. 5, 2017. Finding the best bass guitar strings can be a challenge. With so many different materials and approaches to bass string design, it can be overwhelming trying to figure out which is going to work the best for you and your style of playing. If you’re unsure which set of bass guitar strings to get, check out the recommendations below! 93 out of 100. Incorporating 425+ ratings and reviews. The D’Addario family has been making strings since the 1600s. They’ve been a key part of the industry since its inception, and judging by their place in the modern guitar and bass guitar string landscape that doesn’t seem like it will be changing any time soon. 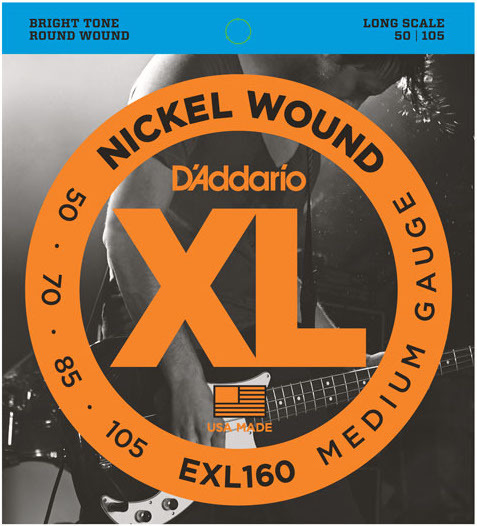 The D’Addario EXL160 Medium Gauge set is made from nickel-plated steel. This means that this set is going to have a great combination of warmth, punch, and articulation; making it a great fit for most modern genres of music. You can also still get a jazzy or more vintage tone with these strings, but if that’s what you’re looking for you may be happier with a pure nickel set. This set will fit long-scale basses though, as with any other long-scale guitar string, it will also fit bass guitars with a shorter scale length. Ernie Ball, a professional musician and entrepreneur, first launched his guitar strings in the 1960s. Guitar strings used to be much thicker on average than they are today, and Ball noticed that many beginners had problems fretting the strings (especially the wound G string on the electric guitar). So, he launched a line of strings that were thinner, eventually gaining the patronage of musicians like the Beach Boys, Merle Travis, and The Ventures. As time went on, Ernie Ball’s endorsers list became a who’s-who of rock and roll excellency. 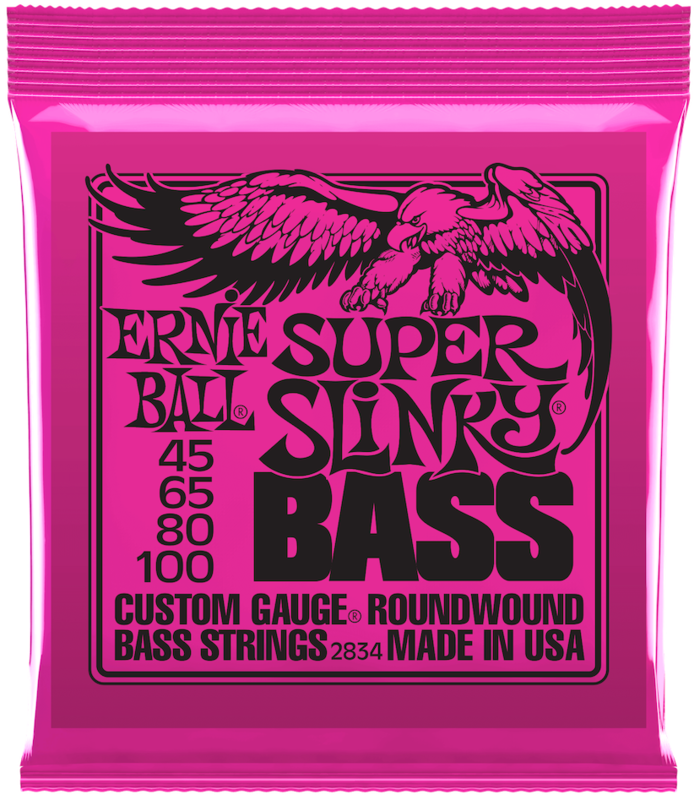 The Ernie Ball 2834 Super Slinky Roundwound set is great for musicians looking for a modern, punchy bass tone. The brand has always produced really bright sounding strings, and the 2834 is reflective of this. With that being said, the set is still really versatile. So unless you’re planning on playing straight ahead jazz or early-country you should get really good results. 93 out of 100. Incorporating 400+ ratings and reviews. Ernie Ball is the string of choice for musicians all over the world because of the company’s consistency and affordability. The price to quality ratio that this company manages to maintain is really impressive, and has cemented them as one of the top guitar and bass guitar string brands in the country. The Ernie Ball 2832 set is a very versatile set, so it’s great for anyone looking to cover a lot of ground. Because the strings are nickel-plated steel they have a warm yet articulate sound. The set’s gauge works towards this as well, because it’s thin enough to have great punch and playability, yet thick enough to create a beefy tone. Outside of a few niche genres and applications there’s nothing that these strings can’t do. There are a few complaints that they don’t have a very lone lifespan but, while that’s something worth considering, seems to be more conjecture than anything. 93 out of 100. Incorporating 600+ ratings and reviews. The brainchild of engineer and musician James How, Rotosound strings have been the weapon of choice for musicians as notable as John Entwistle of The Who, Cliff Burton of Metallica, Guthrie Govan, Colin Greenwood of Radiohead, and Geddy Lee of Rush. The most important thing to know about these strings is that they’re made from stainless steel. Stainless steels strings are notably brighter than pure nickel or nickel-plated steel strings. This makes them great if you’re looking for a more punchy and articulate bass sound, or if you’re looking to pop or slap. Though this does mean that they won’t perform quite as well if you’re looking for jazzier tones. This set, referred to by Rotosound as standard, is a medium gauge set of strings. These have a pretty good combination of playability and warmth, though if you’re looking for a thinner gauge string (which will also be easier to play) you’re going to want to go with a different set. 93 out of 100. Incorporating 125+ ratings and reviews. The BS66 is made from the same material as the set above, so the two sets are going to sound very similar. When you use stainless steel for guitar and bass guitar strings, you get a tone that’s fundamentally bright and punchy. It’s great for modern and aggressive music, as well as funk. 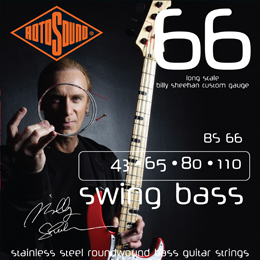 However, the BS66 is Billy Sheehan’s custom set. The only thing that differentiates it from the set above is that the G and E string are a different gauge, with the G string being thinner and the E string being slightly thicker. In practice, this is going to cause a more substantial difference in playability than it will in tone. Though with that being said, the E string is going to sound a bit fuller on the BS66 set than it will on the RS66LD featured above. The first thing to know about these strings is that, while the company calls them “chromes”, they’re actually made from stainless steel. Chrome plating is actually made from chromium, and is expensive enough that it probably wouldn’t be commercially viable for guitar strings. 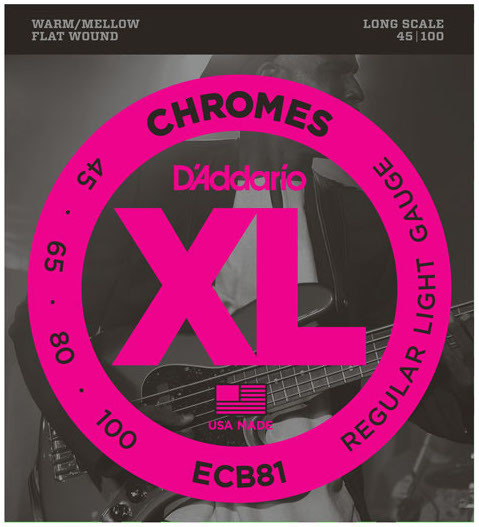 With that out of the way, the D’Addario ECB82 set is a medium gauge set of flatwound guitar strings. Flatwound guitar strings are less textured than roundwound strings, which has a few different effects on how they perform. The most notable difference between round and flatwound guitar strings is that flatwounds have a much darker tone. Basically, this means that there’s going to be less high, high-mid, and mid frequencies in your tone. They don’t have the punch of roundwound strings, but they’re still pretty versatile when used on the bass guitar. They also tend to last longer than roundwound strings. Though Fender is known for their instruments and amplifiers, the company has actually made their own strings for quite a while now. They may not be as popular as Ernie Ball or D’Addario strings, they have a pretty sizeable following. Because these strings are flatwounds, they’re going to have a very warm tone when compared to roundwound strings. They’re great for smooth basslines, jazz especially, but they’re not going to have the punch you’d get with roundwound strings. This set’s gauge is a light enough to have a lot of playability, and because they’re flatwounds they’re not going to have the thin sound you usually get with lighter gauge strings. And like other flatwound strings, this set is going to last significantly longer than a set of roundwound strings. 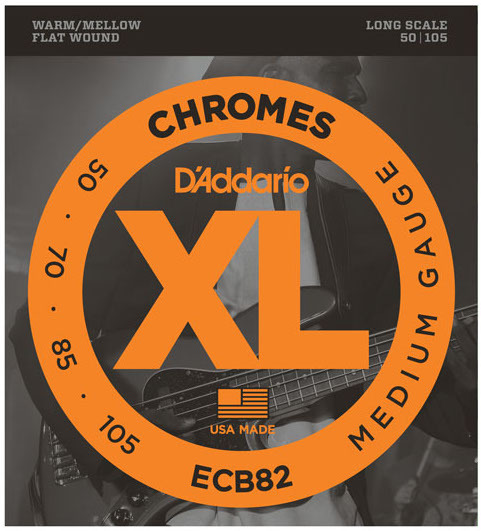 Like D’Addario’s other strings, the ECB1 XL Chromes set is made in the U.S.A. While the U.S. doesn’t have a monopoly on making quality pieces of gear, strings made in countries with higher labor standards generally have a higher degree of quality control. The EXB81 XL set is a flatwound set, so it’s going to have a warm and full tone. This is great for vintage genres and more laid-back genres, because it makes you bass blend into the mix instead of cut through it. The set is also of a light enough gauge to facilitate fast and melodic bass passages, though these strings will be a bit harder to play than light gauge strings. These strings are also long enough to fit long scale bass guitars, fitting on basses with a scale length up to 36 ¼ inches. If your bass isn’t quite that long, you can just cut off the remaining length of string after you’ve finished stringing your guitar. The first company to coat strings in a polymer, Elixir has been a fixture in the industry for decades. The brand has been at the forefront of guitar and bass guitar string innovation since its inception, and judging by the company’s current reputation that doesn’t seem to be changing any time soon. 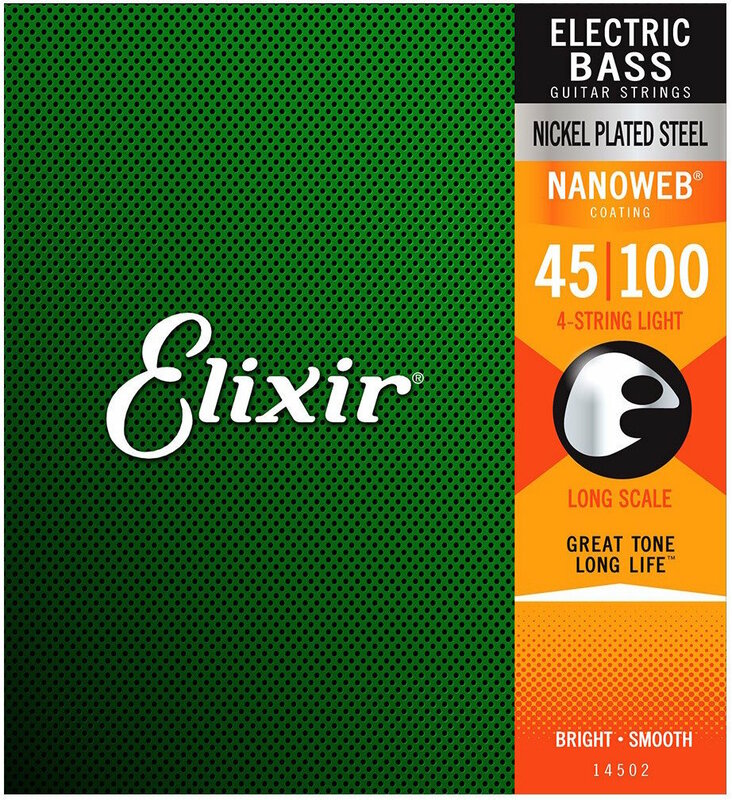 The Elixir Nickel-Plated Nanoweb set has a very warm tonality. A lot of musicians don’t like coated strings because they feel that coating a string deadens it, reducing the amount of frequencies it can produce. While it’s true that there is some high-end roll-off in coated strings, they don’t sound bad. They just sound different. They also help to increase a string’s lifespan, which comes in handy if you’re constantly playing or don’t want to deal with the hassle of changing your strings. Another benefit of coated strings is that the coating helps to reduce finger noise, which is a squeaky sound that you get when you run your hands along your guitar’s neck. 95 out of 100. Incorporating 475+ ratings and reviews. Thomastik strings are a high-end product, designed for those who are looking for a particular type of tone. They aren’t better than cheaper strings, but they do fill a particular niche very well (the company sells a variety of strings, with different models being intended to do different things). However, because they are a niche product that does mean that they’re going to be significantly more expensive than a lot of their competitors’ strings. This set is unique in that it’s one of the few pure-nickel flatwound bass strings readily available. This gives the strings a very warm tone, perfect for jazz. In fact, most of the company’s endorsees are jazz musicians. While many of the endorsees for Thomastik do favor jazz, the strings are still pretty versatile. They don’t have much punch, which to be fair is to be expected from flatwounds, but there are a few examples of bass guitarists from heavier genres who like the brand’s strings (like Peter “Peavey” Wagner of Rage). If you’re looking to learn more about bass guitar strings, check out the sections below. We’ll cover things like how string gauges and materials change your tone, as well as how to find the right strings to get the tone you want. When we talk about “gauge”, we’re referring to how thick the strings are. So, for example, when someone says “heavy gauge strings” they’re talking about strings that are thicker than what you’d normally encounter. The heavier the string, the harder it’s going to be to play. Because the string itself is thicker it takes more tension to get it up to pitch, and the more tension a string is under the harder it is to press down. The opposite is true with lighter gauge strings, which are significantly easier to play than heavy gauge strings. Heavy and light gauge strings also sound different. The heavier the gauge of string the warmer it’s going to sound, and it’s also going to produce a stronger signal (which means it will be louder coming through an amp). Lighter strings are the opposite, so they’re going to brighter and produce a quieter signal. Strings are made from a variety of different materials. Below we’ve listed a few of the most common ones, and how they sound in relation to one another. 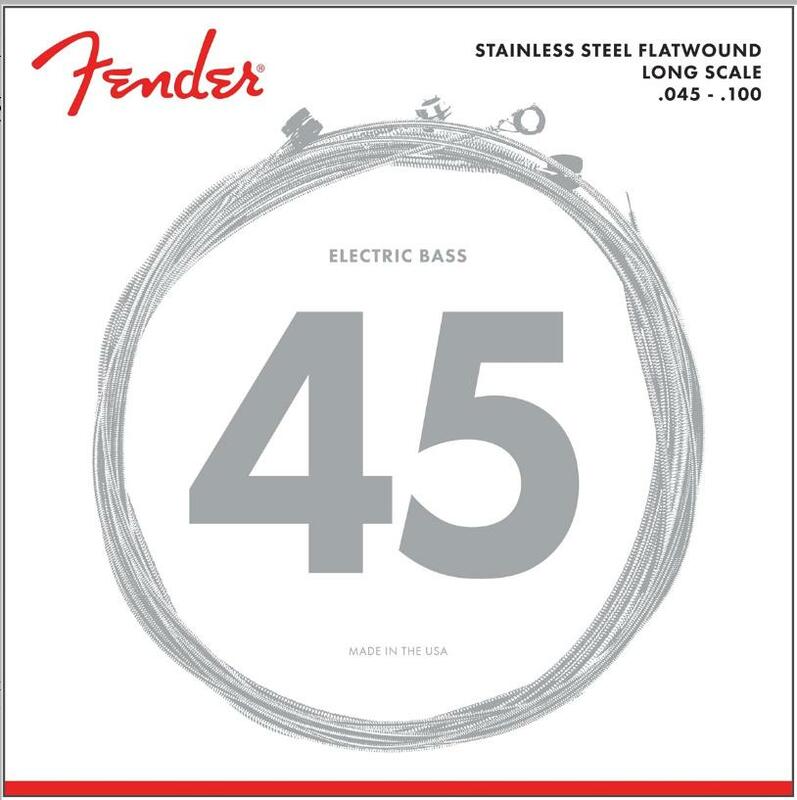 Stainless steel guitar strings are the brightest sounding electric bass guitar string. Because they’re made from stainless steel, they’re also more resistant to corrosion than a similarly constructed string made from nickel. 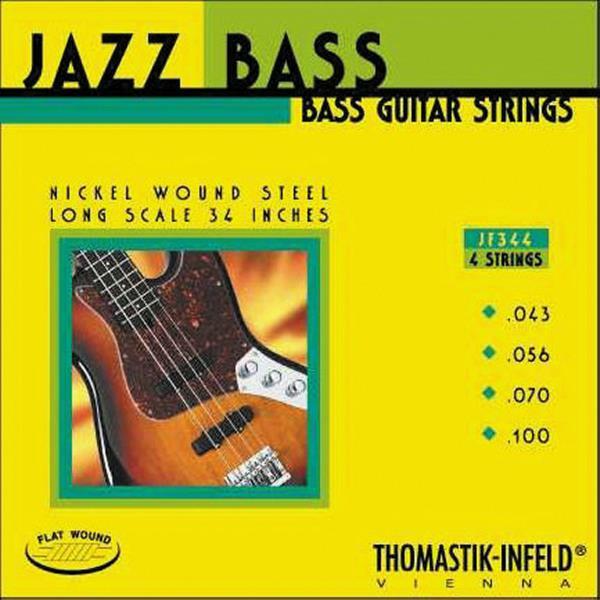 Pure nickel bass guitar strings are significantly warmer than steel guitar strings. They’re great if you’re looking to emulate vintage bass tones, though they do lack the punch and clarity you get with stainless steel bass guitar strings. Nickel-plated steel strings are a great compromise between pure nickel and stainless steel guitar strings. They have a great combination of punch and warmth, though it should be noted that they aren’t as corrosion resistant as stainless steel strings. Flatwound and roundwound refers to a strings winding. Winding is the wraps of wire on a string. Roundwound, the most common winding, feels textured like the edge of a quarter. Flatwound is smoother (though still slightly textured). Roundwounds have a brighter tone and more pop than flatwound strings, making them a good choice for those of you who are looking for a brighter and more aggressive tone. 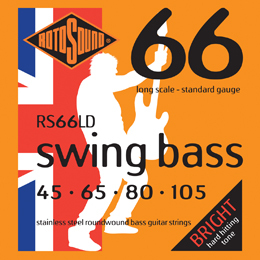 Flatwound strings are very warm and thumpy, which makes them great for smooth, melodic bass lines. And because they’re not as textured, less dirt and oil sticks inside of their grooves; making them last longer. Just like the wrapping of your string, your string’s core is also going to have an impact on your tone. Hexcore strings, the most common type of string, have a hexagonal surface. Roundcore strings look like a piece of spaghetti. The main benefit of roundcore strings is that they’re easier to play. The wrapping is looser, so the string is under less tension. However, the does also mean that they don’t have the articulation or punch of hexcore strings (though this might be a bonus if you’re looking for a warmer tone!). Coated strings are strings that are coated in a polymer to increase their lifespan. Coated strings are a controversial topic in guitar playing circles, with some loving their increased longevity and others feeling that the coating robs strings of their tone. We wouldn’t necessarily say that coating a string hurts its tone, but it definitely does cause some high-end loss. This isn’t really a bad thing, but it’s something to be aware of. If you like really warm sounding strings, a coated set might be right up your alley. Conversely, if you want a really bright tone from your strings you might be better off going with a non-coated alternative. A lot of bassists ask, “What strings should I use if I want to play X genre?”. And that’s a good question to have, because it stands to reason that if strings have certain characteristics based off of what they’re made from than there should be a clear cut answer to which string is best for a given situation, right? Well, it’s not quite that simple. The main thing to know is that you have to balance the tone of your strings with the tone of your amp and your guitar. So, say you want to play jazz. If you have a darkly voiced bass and amp, going with pure nickel flatwounds might make your tone too muddy. With that being said, there is a table below that shows which strings have the potential to work in a given situation. But before you make up your mind which set is right for you, be sure to double check how your bass/amp sounds compared to how you want it to sound. When we set out to create this guide, we knew that we had to limit our scope because of the many material, gauge and design variations that are available. As such, we decided to stick to widely available 4-string bass guitar string sets that are popular and highly rated. 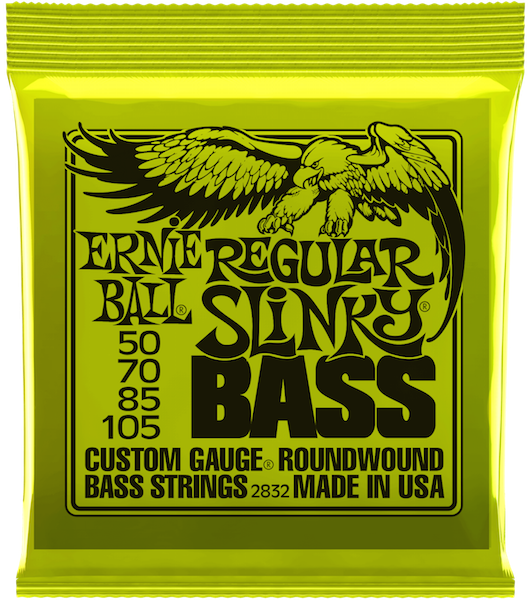 But even with this limitation, we ended up gathering almost 8000 reviews and ratings data for over 30 different bass string sets. All these data are processed via the Gearank algorithm, and provided us with the scores that we used to narrow the list down further to just the top tier ones which are included in this guide. For more information about this process see How Gearank Works. Submitted by Laughing Gravy (not verified) on Dec. 24, 2018. Actually, D'Addario makes Fender's strings. And you should mention Flatwounds are easier on the fingers and less noisy. Submitted by Stephen Walsh (not verified) on Feb. 4, 2019. Seems like this article was sponsored by Sweetwater. Submitted by Jason Horton on Feb. 4, 2019. There are advertising links to both Sweetwater and Amazon (the blue buttons with their names on them) on this page, but neither of those two companies were involved in the process to select the sets of bass strings that we recommended. As with all our guides, you can see how we made our selections in the Methodology section and additional information is available in How Gearank Works.